August 13, 2014 at 11:49 am EDT | by Lou Chibbaro Jr.
Design announced for LGBT Veterans Memorial in D.C. The board of directors of the National Lesbian, Gay, Bisexual, and Transgender Veterans Memorial Project has announced the selection of the design for the monument, which is planned to be placed in D.C.’s Historic Congressional Cemetery. An announcement released by Congressional Cemetery says the design consists of three black granite panels standing 11 feet high, five feet wide and one foot thick. Two of the official emblems of the nation’s six military branches will be placed on each of the three pillars – with the Navy and Marines on one and the Army and Air Force and the Coast Guard and Merchant Marines on the other two, according to the announcement. “The monument is simple yet stately and will stand proudly on its site just as those it represents served this country with pride,” a statement from the LGBT Veterans Memorial Project says. “The pillars will be placed in a triangle allowing space for visitors to walk inside where there is a flag pole and inscriptions explaining the Memorial’s meaning and the history behind it,” the statement says. Nancy Russell, chair of the four-member National LGBT Memorial Project’s board, said the board is hopeful that the project’s ongoing fundraising effort will generate the projected $500,000 needed to build and install the monument in time for a Memorial Day dedication ceremony in 2015. However, she said the installation may be moved to 2016 if sufficient funds aren’t raised in time. “Most of the funding for the project will come from LGBT veterans who want to have their service memorialized by purchasing a paver with their name and service information engraved on it to be placed on the memorial grounds,” the statement by project says. Russell said additional funds are expected to be raised through the purchase of space for the interment of cremated ashes of eligible veterans and their partners or spouses within the memorial grounds if there is a demand for such interment. According to Russell, the project’s board sought proposals for the design of the monument through a design competition but board members chose not to select the five or six proposals submitted through the competition. Instead, she said board member Marty Gunter proposed that the board itself – whose members are all military veterans with many years of military service behind them – come up with a concept for the design and hire an architect to put it on paper. She said Gunter presented the board with the concept of the black granite pillars as he saw it and fellow board members enthusiastically approved it and presented it to a San Antonio-based architect. “He did a beautiful job,” she said of the architect’s final design. Paul Williams, president of Congressional Cemetery, which is privately owned by Christ Church of Capitol Hill, said the non-profit LGBTVM has already purchased a site for the memorial. He said the site is located near the gravesite of U.S. Air Force Sgt. Leonard Matlovich, who came out as gay on the cover of Time magazine in 1975 to become the first active duty service member to challenge the military’s ban on gays. 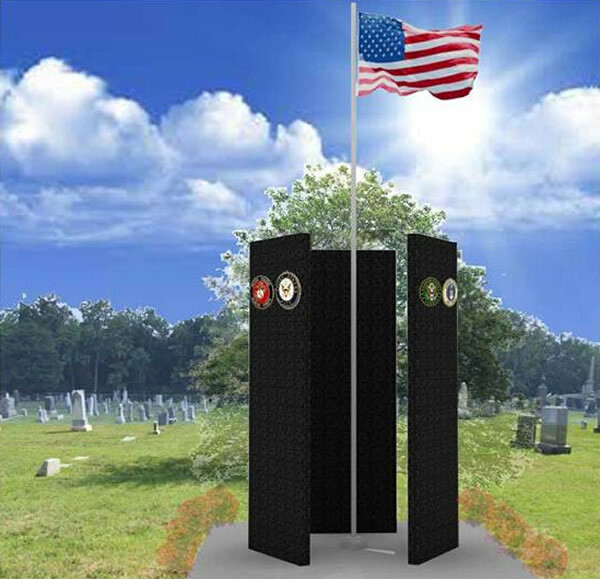 Williams said in the cemetery’s statement announcing the design approval for the National LGBT Veterans Memorial that the gay section is thought to be the only LGBT cemetery section in the world. “We fully support the LGTVM project, and look forward to adding this important national memorial to our historic grounds,” he said in the statement. Russell called on LGBT veterans and their straight allies and supporters to make a donation to the project through its website at nlgbtvm.org or by mailing a contribution to NLGBTVM, P.O. Box 780514, San Antonio, Texas 78278-0514. This is just so important. To honor those fighting for rights they were denied at that time is a true show of respect for what they have done. This future monument is simple, yet classic in its' rendition. Excellent design and choice! The Vietnam memorial depicts African Americans and Latinos so why can’t something honor the contributions of Gays and Lesbians that have been so often disrespected despite their contributions fighting for this nations freedom? Too often such people have been unfairly discharged, sometimes dishonorably, simply for being gay and for no other reason! The idea to do this is good but I don’t like the design. It tends to hide the fact that it honors gay and lesbians. There is nothing that distinguishes as a gay monument. If the whole purpose is to honor being gay and lesbian in the service, then why hide what it is? I wouldn’t know the purpose unless I read what is inscribed on it. You also have to walk within the monument to read what the monument is about. It kind of hides it from view. It is a very bland design. So you will not generate any excitement: money.